There are many things in life we take for granted but perhaps nothing more than emergency help when we need it. “Whenever the situation is beyond the control of the people, they call 911,” says Captain II Rex Vilaubi, C Shift supervisor at Los Angeles Fire Department #63 in Venice. Their calls see it all – homicides, drug overdoses, shootings, stabbings, domestic violence, births, automobile accidents, accidental fires, arson, stalled elevators and the proverbial cat in a tree. Some situations are not in training books. “We put our heads together to come up with a solution and it usually works for us,” he says. I was fortunate to spend almost 22 hours over two days with the C Shift firefighters in order to bring you an appreciation of the men and women who save our lives. This will be a two-part column to give a sense of their life in quarters and out on runs. The day starts at 6:30 am when one shift relieves the other. There are discussions and updates on what went on during the previous work period. The firefighters ready their turnout (the jacket alone weighs 25 pounds and has attachments for tools, a face piece, and breathing apparatus; the matching pants are rolled onto and over the boots so a firefighter can quickly put them on by stepping into them and pulling up the pants) and personal protective equipment. Every day there is an inventory check on the fire truck and engine to make sure that nothing is lost or broken. There are more intensive weekly and monthly checks. “We look at every tool, every piece of equipment to make sure it’s there and in race-ready position,” says Captain Vilaubi. “Line up” is at 8:00 am when the captain talks about what is expected of the day, who is working and gives out any pertinent information that is needed to be passed down to the firefighters. If time allows Monday through Friday, C Shift firefighters will go to the beach to exercise – playing paddle tennis, running on the beach, working out with weights or walking. They always stay close to the Venice Blvd. parking lot in case there is an emergency call. “It is great camaraderie for us and the guys get their exercise at the same time,” says Captain Vilaubi. On weekends, the firefighter’s drill. They always have ongoing training. In 2001, I did another ride along and played the “victim” in an auto accident so the rookie could practice extrication (tearing up a car by popping doors, moving seats back and taking the roof off) with the “jaws of life.” This was to simulate a physical rescue when responding to a traffic accident where someone is trapped in a car. Station #63 was built in 1942 and is the third oldest station in Los Angeles. Since I was there in 2001, the electrical system was upgraded, a diesel exhaust system was installed, staircases were enclosed so not to let the fumes creep into the sleeping area, the kitchen was updated with new cabinets, counters and a maintenance-free floor and the old handball court was converted into a physical fitness room. The weights in the physical fitness room were previously located on the floor next to the rigs by the turnout coats along the wall. When one shift relieved the other, the gear of the previous shift was put on the wall. There are three shifts with twelve firefighters per shift. “There were so many coats you couldn’t walk through,” says Captain Vilaubi. Wooden lockers around the pillars also took up a lot of room. 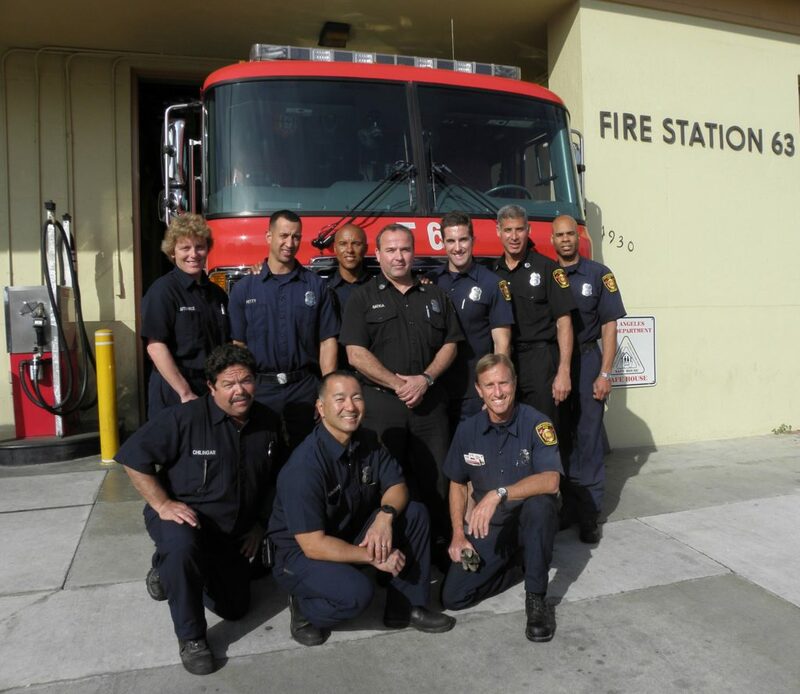 The LAFD doesn’t have a station housekeeping budget and the firefighters depend on the kindness and generosity of others to help improve their living conditions. Jason White, Managing Director of Swett & Crawford Professional Services Group, had an opportunity through grants from the Fireman’s Fund Insurance Company to donate $10,000 to the fire station of his choice and, once needing #63 to put out a fire at his house, that’s the one he selected. “I was so stoked to be able to help those guys,” he says. The majority of the money purchased specialty lockers made from high grade coated tubing with a wire grid. Now the firefighters have their own individual lockers to store their equipment. They are organized and neat and keep the apparatus floor clean in addition to keeping the gear dry because of the grid system. The carpet in the sleeping quarters was so bad that the firefighters considered it “condemned.” Willy Horvath of Mare Company Sails and a member of the Venice Rotary Club came to the rescue with a new carpet by contacting Mark Skipwith, owner of Carmona Flooring. The installation was paid from the balance of the Fireman’s Fund money and Mark, giving a deal on materials, waited until the May pancake breakfast to be paid from those proceeds through the Venice Rotary Club. Speaking of food, if you ever see the #63 fire truck at Costco during the day, it’s not that there’s a fire. The firefighters are buying food for their dinner. Not only are they responsible for paying for all their meals, they have a separate house fund to pay for condiments, a water purification system, the newspaper, Direct TV and laundry soap to name a few things. There is no maid service and they take turns cooking, washing dishes and washing both the kitchen and apparatus floors to make sure the station is spotless for the next day – whether for them or the next shift. There are ways the community can help the firefighters. Our lifesavers will appreciate it. Please call 310-575-8563 to find out what you can do.